Chocolates and celebration go hand-in-hand, be it birthday or wedding or any celebration, I have never seen a event go without chocolates. During college days, I used to hate chocolates and anything that use cocoa. I remember that I never used to go for chocolate cakes during my friends birthday celebrations. Those days everyone used to wonder as how can I hate chocolate. All this stopped when I started making my own chocolate cake. If I remember exactly, the days before my marriage, I stayed with my cousins and I used to cook food at my home everyday. Those days I had a keen interest to try out new dishes because my cousins were there to eat and praise me however good/bad the dish may be. In fact they are one of the reasons for igniting my passion in cooking. Baking cake was one of my aspirations those days. I learnt that one can bake cake even without an oven when I spotted a Pillsbury cake mix during a grocery shopping. Words can not describe my happiness and vanilla Pillsbury cake mix got a place in my grocery list. oh ho.. the time had come to open the pressure cooker. The cake came out well and it was spongy too. but the color was not appealing to eat. I latter learnt that it can happen only in a oven. I was a bit disappointed and my sister suggested that I should try a chocolate cake mix where color wouldn't play bigger role. 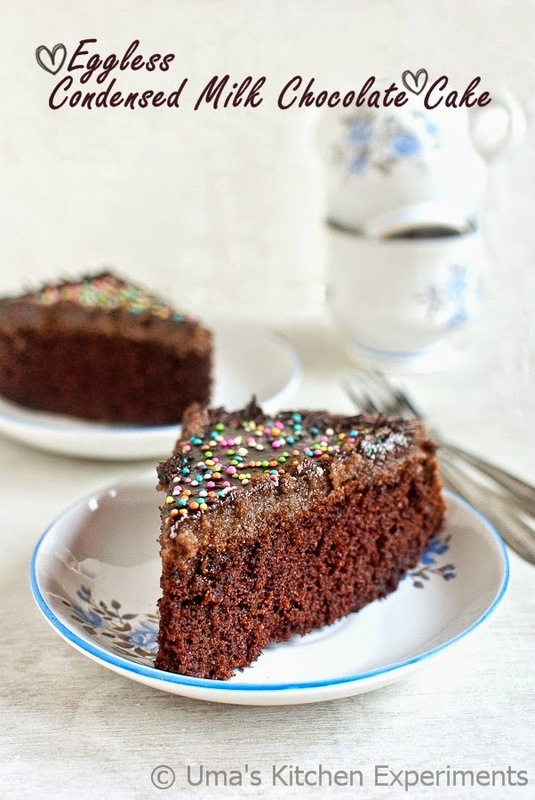 I tried and the cake came out in the color I desired and from that day I became a fan of chocolate cakes. If I start talking about my cooking experience, it would keep dragging and thi spage won't be enough. 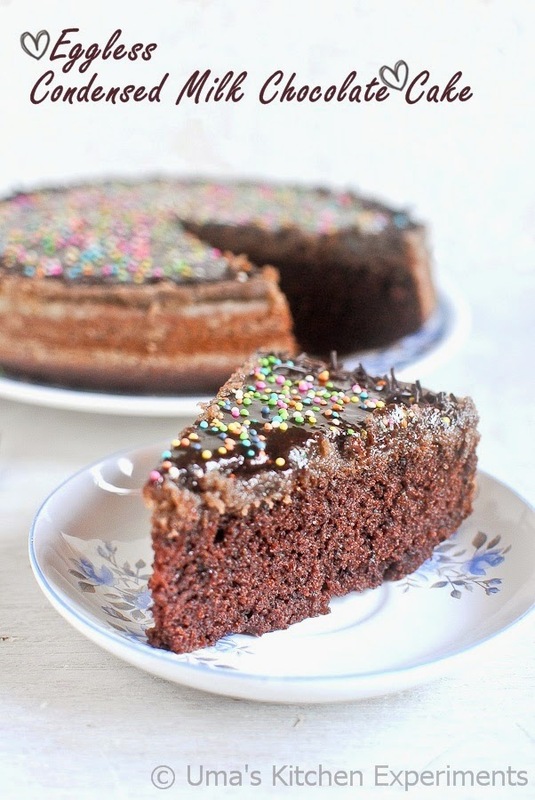 So, Let me stop here and come to today's recipe- Eggless condensed milk chocolate cake. Yesterday was my MIL's birthday and this is the first time I baked a cake for her. She normally doesn't prefer sweet recipes. I thought she would like this cake as it has only mild sweetness from condensed milk and moreover it can be eaten as a snack time cake without frosting. But those who like sweet, frosting is a must. 1) Preheat the oven to 180C for 15 minutes. Grease the 8inch round baking pan with butter first and the dust it with flour. Keep aside. 2) In a wide plate/mixing bowl, mix all the dry ingredients(All purpose flour, Cocoa powder, Baking powder and Baking Soda) and sift it well for even mixing. 3) In another large mixing bowl, mix condensed milk, oil, water and vanilla extract. 4) Add the sifted dry ingredients and mix well. If there is any small lumps just ignore them. 5) Pour the cake batter to the prepared cake pan and bake it in the oven for 30 minutes or until the skewer inserted into the center of the cake comes out clean. 6) Keep the cake pan in a wire rack for 5-7 minutes and then invert to cool completely. 1) Once the cake is cooled completely, apply the chocolate oreo butter cream frosting on it. I applied only on the top of the cake. 2) Pour the chocolate sauce on top of it and pat it evenly. 3) Sprinkle the edible sprinkles and chocolate vermicelli. Slice and serve. 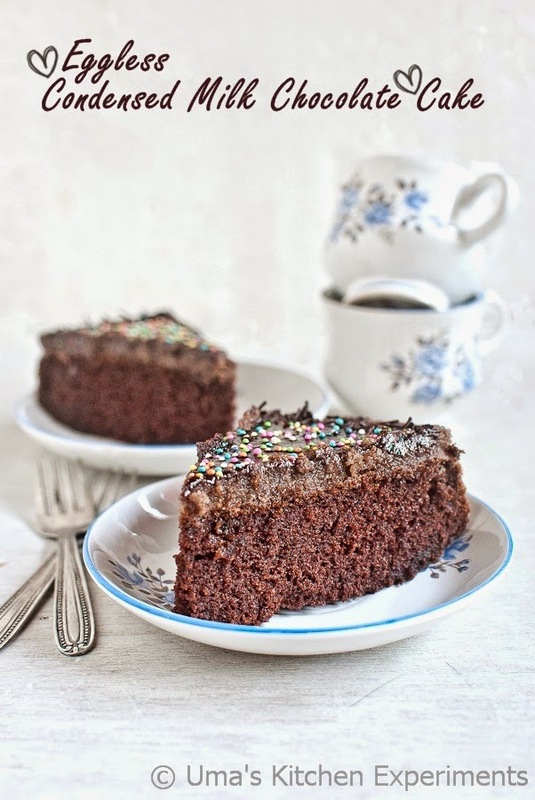 1) Since the recipe doesn't call for sugar, good to have this as a tea time cake. But to get a balanced taste, add the frosting with more sugar. 2) You can use the full tin of condensed milk for this recipe. If using, reduce the water quantity to 3/4 cup. 3) Frosting is completely your personal preference. It can be of simple butter frosting or chocolate ganache or cream frosting. 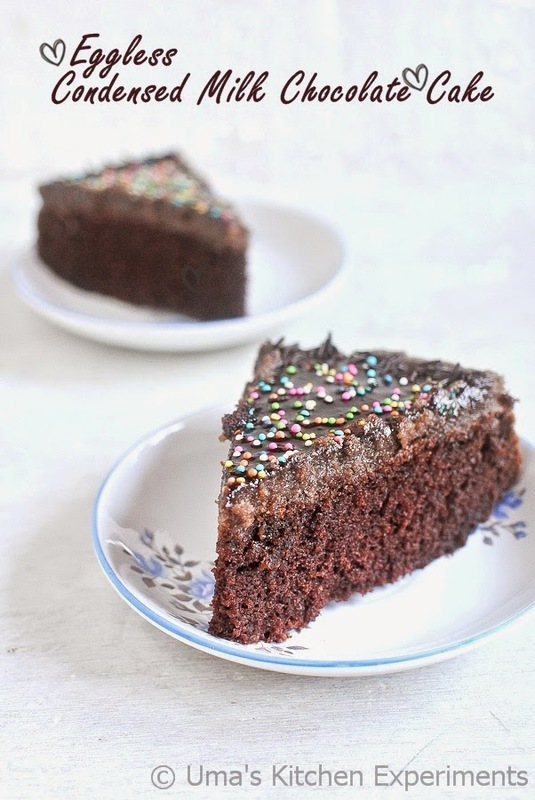 Eggless cake looks extremely spongy with a beautiful light and airy texture. I love condensed milk cake the texture is really good..